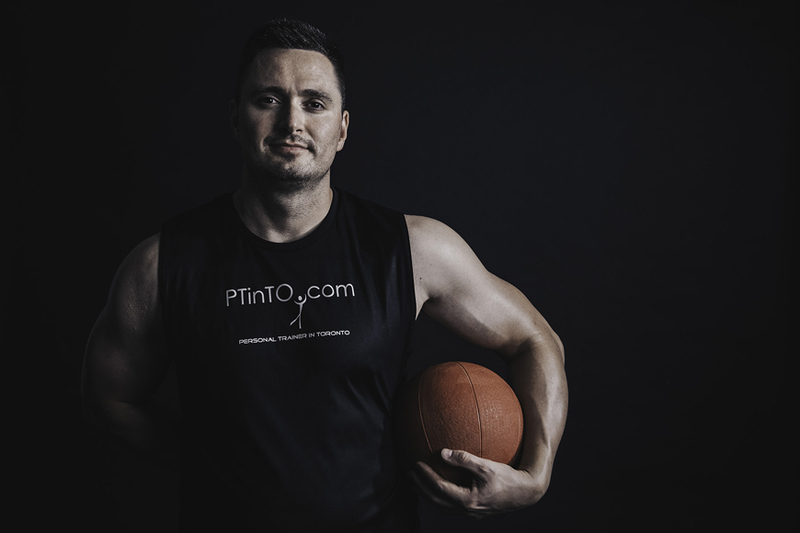 Personal Training is available throughout Toronto (areas include: Yorkville, Annex, Forest Hill, Midtown, Lawrence Park, Bayview Village, Bridle Path, Rosedale, Church and Wellesley Village, High Park, and Kingsway), Etobicoke, and Mississauga. Sessions are held in homes, condos, and outdoors. Studio personal training is also available at Studio-Fitness (74 Bathurst Street) or at the studio of your choice. The fitness assessment includes: girth measurements, body fat percentage (using calipers), cardiovascular fitness (resting and recovery heart rate and blood pressure), strength tests, and flexibility tests. The assessment helps to make effective goal setting and to measure progress. This consult and assessment is complimentary service when you purchase a training package. Assessment and reports are offered separately for $100+HST. Specific exercise programming and nutrition counseling tailored to your goals. You will learn safe and effective techniques. Personal training sessions are an hour and include; strength training, cardio, and stretching. A full range of fitness equipment available is brought to you. 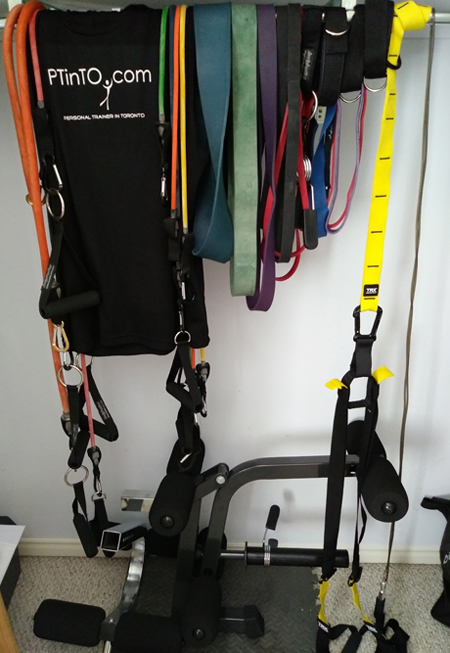 Some of the tools we may use in your workouts include:free weights, kettlebells, resistance bands, Indian clubs/clubbells, battling rope, TRX suspension trainer, medicine balls, stability balls, Power Wheel, Lebert Equalizers, Bosu ball, ab slings, gymnastic rings, plyometric boxes, weight sled, agility ladder, full kickboxing gear, Rumble Roller, Trigger Point Therapy kit and much more! Waiver AND Release of Liability" HERE and HERE . * Add $20/session to train with a partner. * Prices Subject to 13% HST. * Payments include; cash, cheque, Interac e-Transfer, or PayPal. * 24 Hour Cancellation Policy in Effect. Exercise Programming and Nutrition Counseling is offered to clients across the Greater Toronto Area. This service includes an 8-week exercise program and nutrition guidance to help you achieve your specific goals. You will learn how to workout effectively and feel comfortable training on your own. At our first meeting, we will complete a comprehensive assessment and consultation (typically an hour). The fitness assessment includes: girth measurements, body fat percentage (using professional calipers), cardiovascular fitness (resting and recovery heart rate and blood pressure), strength, and flexibility. This will allow you to being monitoring your progress. During the consult we will discuss; your goals, health history, injuries, lifestyle and dietary habits. A second meeting will be required for the demonstration of your program. Each exercise of your daily routines will be demonstrated and performed to ensure you have the correct form and technique. This small group boot camp (group limit 10) utilizes high intensity interval training (HIIT), circuit-style. Sessions include mixed cardio, and strength training drills, followed by flexibility exercises.Typically 45 seconds to 1 minute of work followed by short 30 second rest periods. These boot camps are for anyone who wants to improve their strength, power, and endurance. You will build muscle and lose fat as an added benefit. Exercises include bodyweight training, battling ropes, kettlebells, resistance bands, and more! * Group limit is only 10. Secure your spot when dates and locations are posted. * Pre-registration required. No drop-ins. This service includes an exercise program tailored to your goals. You will be required to fill out a questionnaire that will allow me to customize a program to your goals/needs. You will receive your 8-week plan (with exercises, sets, reps, tempo, and rest times) via email within a week of payment. Ongoing email support is provided to walk you through your plan. I advise having a fitness assessment prior to the start of your program and after the 8 weeks are completed. For your convenience, online, live personal training, and coaching is offered via Skype and Google Hangout, or your preferred method. 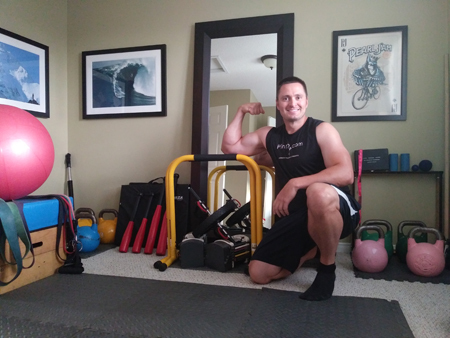 You can train at your gym/studio or at home and I will walk you through your workouts (with detailed cues and corrections) from my fully equipped home gym. Minimal equipment and space is required for home training. This will cost a total of only $1800-$2000 - the cost of a 2 year gym membership. See my full equipment list below. 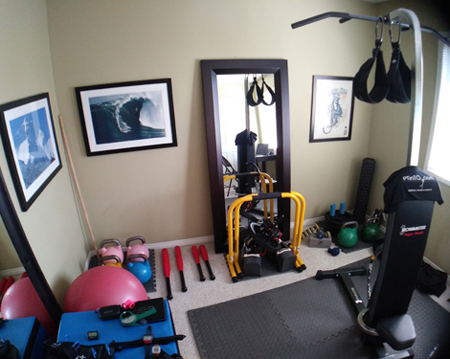 Space requirements are 160-200 square feet (my training room is only 160 square feet). I also offer online coaching to help guide you on your fitness journey. My coaching sessions will help you: design a workout plan for your goals. I will also provide nutrition and lifestyle tips that will direct you on the right path for success. I prefer to use competition kettlebells as they are standard size. They however, more expensive than Russian/non-competition kettlebells. I have pairs of 8kg, 12kb, 16kg, and 24kg. I use light to heavy – red, black, purple, and green. I use Bodylastics as they are adjustable and durable. I use the Lifeline Power Wheel. I use an adjustable box that goes from 12” to 36”. I use the IronMaster Super-Bench. It can handle 1000lbs and you can attach a crunch attachment, leg curl and extension, and pull up bar attachment. I use the black model Rumble Roller and Trigger Point Performance Therapy Kit. Topics/activities of the corporate fitness and wellness programs and seminars include: effective exercise program design, flexibility training (focusing on essential stretches for office employees), cardiovascular training/ bootcamp, healthy eating (for fat loss, muscle building, energy, etc. ), and stress management. These programs and seminars are informative and engaging. The primary goal of the program is to improve health and wellbeing of the team, minimizing absenteeism and boosting productivity. A secondary goal is to help team building and cohesiveness by communicating and working together on a common goal. Employees appreciate a company that invests in their health.